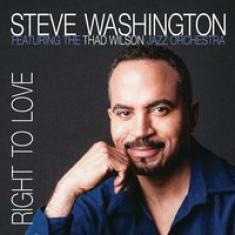 Steve Washington's new album Right to Love is a reimagining of some of the best jazz songs ever written. His tender voice creates a more romantic and delightful rendition of these classics. Washington gives a nod to the original tunes while putting his own brilliant spin to it. The versatility of his voice was showcased in this album as he weaved through some slow and fast jazz tracks. Washington's version of Billy Eckstine's "Caravan" is invigorating. It has a touch of mystery with a Mexican vibe to it. The Thad Wilson Jazz Orchestra did an excellent job in giving a livelier rendition of the song. The trumpet solo is impressive and Washington's vocals matched the intensity of the orchestra. Joe Williams' "Alright, Okay, You Win" is one of the most loved jazz songs ever, and Washington did justice in his own spirited version of the song. He made it more playful and modern with his rhythmic and magnetic take. He made the already catchy tune more appealing and addicting. His more upbeat and groovy version of this classic is simply charming. Couple that with the irresistible lyrics, "Alright, okay, you win/I'm in love with you," this cover is a winner. Washington decided to make two versions of Richard Harris' "MacArthur Park" in the album. The exquisite piano intro will immediately grab your attention. Interestingly, Washington didn't sing the popular part that most people are aware of. Instead, he reimagined the part sandwiched between instrumentals in the original song. Listening to it will make you appreciate the most inspiring part of "MacArthur Park." You will not hear anything about "that recipe again" but you will be enthralled by the simplicity and depth of "There would be another song for me." The second version was delivered with more grandeur and emotion. It's a moving piece worth playing over and over again. These are only some of the incredible tracks in the album. Washington also did covers for Luther Dixon's "I Was Telling Her About You," Al Jolson's "Avalon," and Gene Lees' "The Right to Love." A beautifully curated album of jazz classics, Washington delicately took liberties as he retained the original elements of the songs while infusing it with his exquisite originality. This tasteful CD will bring back old memories and create new ones. Washington skillfully merged the past and the present in an enchanting synchrony of harmonies brought together in one impressive collection.